(Chicken Exploitation - Egg Production - 13) Many hens get their heads stuck beneath the feeding trough and die of dehydration. We believe this happens because the hens are trying to rescue their newly laid eggs which have rolled away. 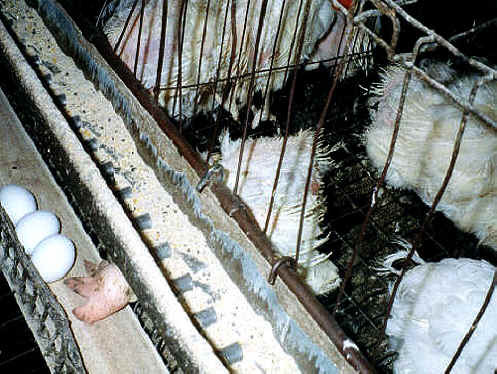 To us, this proves how emotionally distressing these "torture chambers" are to the chickens, who on top of all of their other suffering, lose their children over and over again day after day.